The RadChartView suite supports couple smart mechanisms which control the axis labels generation. 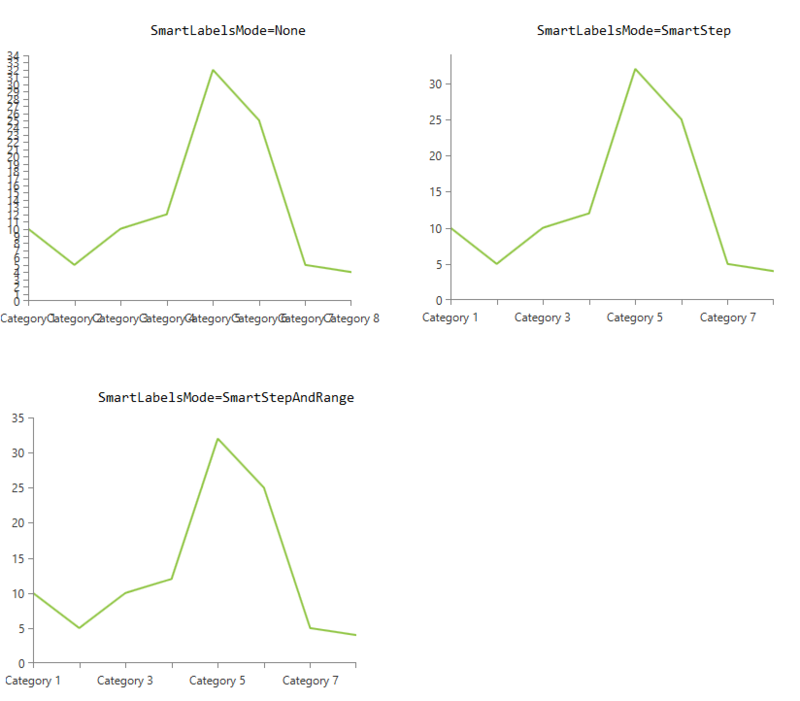 SmartLabelsMode: If enabled this feature tells the chart to recalculate the actual step of its axis automatically in order to prevent the axis' labels from overlapping one another. The recalculation logic is executed on update of the chart's layout (like resizing). IsStepRecalculationOnZoomEnabled: If enabled this feature controls if the axis should recalculate the actual step it uses when the chart gets zoomed. By default both mechanisms are disabled. You can enable the smart labels mode by setting the SmartLabelsMode property of the axis. This mode is supported only by the LinearAxis and the LogarithmicAxis. The following picture demonstrates the different modes. You can enable the automatic recalculation of the axis labels when you zoom in/out the chart by setting the IsStepRecalculationOnZoomEnabled property to True. This mechanism is supported only by the chart's numeric axes.